TELL US A LITTLE ABOUT YOUR OWN INDUSTRY BACKGROUND AND WHAT BROUGHT YOU TO ‘FASHION’? In a few words; branding, marketing, tech, startups, fashion and now a fabulous combination of them all. I have been lucky to have a pretty colourful background in a diverse range of industries and countries, working for some pioneering people and companies. In October of 2014, I decided to change track from my 20 or so years working for other people and set up on my own. This was the beginning of Hills & West, my all Australian-made, lifestyle bag and accessory label. My love for fashion started at a very young age, always doing dress ups and styling my friends. It was always a passion on the side while I build my career in marketing and tech. However every year, to temper my creative hunger and to help me to continue to grow, I would always try and learn a new skill. I have been doing this for as long as I can remember, and activities have included; meditation, DJing, fashion drawing, Dragon Boat racing and French. In 2014 I decided I would gift myself a luxury handbag-making course in Milan, between my Singapore and London work trips. I was instantly hooked. I loved the artisan techniques, their passion, the history and craftsmanship and all I wanted to do was come back home and make Australian luxury pieces, at attainable prices. My new path had been carved. After I resigned from my global role in tech, people kept asking if I was scared and nervous to go into the unknown. I had not really thought about nerves as I was more of a jump first and think later kind of person. I had created and grown so many businesses for other people, so why not do it for myself. I knew that I had the passion, confidence and support network to help me through any challenge. This has been the dream and is what drives me everyday. HOW DID HILLS & WEST COME TO BE? WHAT IS YOUR VISION FOR THE BRAND? I drew inspiration from my experience as a frequent flyer for work. I always had to go from the plane to the boardroom, to dinner, to the plane again… and many variations of the same dance. My ‘seedling’ vision for Hills & West was to create a product for professional women that were sophisticated, stylish, versatile and practical. Today, Hills & West is a minimal accessory brand that aspires to declutter and simplify, always of the highest quality and with a versatile twist. The collections are catered to the busy lifestyles of the modern man and woman and are available online, and in collaboration with other designers and boutiques, at an accessible price point for quality handmade pieces in Australia. As I build on my collections, I am inspired by my customers who always say, wouldn’t it be great if Hills & West did a…. this is where the shopper, weekender and my cowhide pillows came from. Always looking at how can I simplify and beautify our everyday. I have to start with the fact that I have been a vegetarian since I was 16 years old. People are always a little shocked when I say that however I have always been supportive of sustainable fashion and against fast fashion and wastage. I am however a huge lover of clothing, bags and accessories. So I always think about how can I be as sustainable as possible and make pieces that are durable, timeless and transeasonal, with an as ethical production process as possible. I think of my pieces more as functional, beautiful pieces that people are proud to wear, share the story behind the piece and keep them for a longtime. When I was researching where to learn the art of handbag craftsmanship, Arsutoria kept popping up. Arsutoria is an established and renowned school specialising in design courses for leather makers of shoes and bags. I was toying between NY and Milan, and I am so glad that my work at the time took me to Europe at the perfect time. The course set the foundations and taught me a lot about the traditional techniques in Italy. 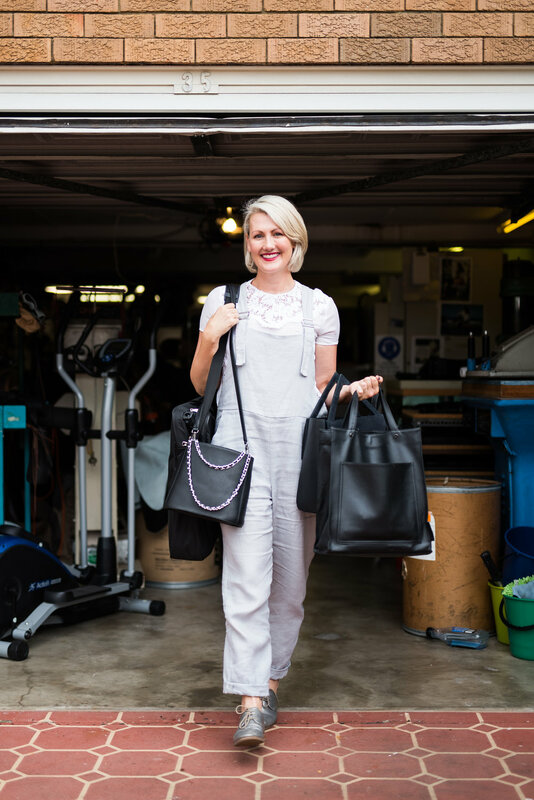 It gave me such an appreciation for the craft of making bags and this passion for handmade traditional techniques is a big factor when finding artisans to work with in Australia. With Australian made products, there is an element of quality care and craftsmanship that cannot be beaten. I love to be hands on in the making process and often spend hours looking at different hides and materials for my pieces. Curiosity fosters creativity; I love brainstorming ideas and am often getting input of others. Whether they’re my husband, friends, other Australian designers, artisans or my teacher from Milan, who I keep in touch with regularly for guidance. THERE IS THE COMMON THOUGHT THAT THE INDUSTRY IS ‘DEAD’ IN AUSTRALIA… WHY WAS AUSTRALIAN MADE AN IMPORTANT FACTOR FOR YOU? HOW HAVE YOU FOUND THE PROCESS OF MAKING LOCALLY AND WHAT HAVE YOU FOUND TO BE SOME OF THE BIGGEST CHALLENGES/ OPPORTUNITIES FOR YOU IN THIS SPACE? When starting Hills & West, it was really important to me to do things locally. With only 9% of fashion being Australian made, I wanted to help reinvigorate this craft locally and proudly introduce Hills & West as handmade in Australia, to the rest of the world. We have the ability to create the highest quality pieces here, ethically and sustainably, so why not try. I am an avid supporter of buying local and homegrown products, and I wanted to innovatively craft pieces with local artisans intertwining my learnings from bag making in Italy and my brand building experience from my previous life. There are of course challenges with crafting in Australia. Labour is more costly and materials not produced in Australia that need to be imported have a heft price tag (especially when you are sourcing sustainable). Also, I wanted to connect directly to customers online, minimising markups through wholesale, however the price point can be challenging as people can’t touch, smell and see the pieces. Especially when you are funding a brand on your own and competing with luxury brands with huge budgets and awareness. I am fortunate that I can do a lot of my creative, marketing and digital work on my own. I am also so lucky I have a wonderful group of Hills & West lovers and ambassadors who continuously spruik my pieces and give me lots of wonderful referrals. Collaborations have also been a wonderful part of Hills & West’s growth. By working with other Australian emerging designers, we have been able to get in front of a lot more people with an appreciation for independent and Australian made. WHAT DOES ‘AUSTRALIAN’ FASHION/STYLE/DESIGN MEAN TO YOU? Being Australian made celebrates so many things that are truly wonderful and unique about Australia. We are unique, love self expression, battlers and are incredibly resourceful. We may be small in population but are vocal in our ideals and creativity. Australian fashion/design has already made a big impact globally and I am super proud to be Australian made and supporting local artisans in a profession that has been slowing down in Australia. RECOMMEND 5! WHO/WHAT/WHERE ARE YOUR LOCAL TEXTILE & FASHION GO TO’S? 1. Lustr – fabulous fashion initiative, started by founders Angela, Lilliana and Jeremy, supporting independent designers. The give emerging designers a voice and a way to connect with locally inspired and motivated customers. You can read my interview with them here. 2. 6 on 771/2 George – I had to share this, my latest collaboration with five wonderful Australian labels in The Rocks including Cedar & Onyx (classic luxury for women of all sizes), Everyday Cashmere (cashmere, silk, and cashmere essentials), Boehm Intimates (lingerie of delicate lace and luxe), Extraordinary Ordinary Day (the holy grail of handmade shoes) and Susan Driver (handmade jewellery). If you are interested check it out until September 16. 3. Semipermanent – founded by fellow Sydney sider Murray Bell and Andrew Johnstone in 2003 is a global creative and design-thinking platform. Over the last 15 years, they have established a community of over 400,000 people and a network of over 800 speakers and artists, across our operation around the globe. I go here to be inspired, challenged and boost my creative juices. 4. Some of my fave home grown labels include that I love to wear and watch in the order they come to mind; Manning Cartel, Dion Lee, Michael Lo Sordo, Alice McCall, Sir the Label, Christopher Esber, Nice Martin, macgraw, Anna Quan, Camilla and Marc, and the list goes on…. 5. Lastly but not less importantly Australian Fashion Council of course for fashion news, tips, resources, events and brining emerging designers to the forefront. Bonus, it’s not local but it is a fantastic resource for what is going on in fashion globally. Great interviews, resources and insights - Business of Fashion. Drop by their 6 on 771/2 George pop-up before it closes on Sunday 16th September! Follow the Hills & West story on Instagram at @hillsandwest, on Facebook as @hillsandwest and on Twitter as @hillsandwest! You can also catch them on YouTube, LinkedIn and Pinterest. Say hello to Aisha at aisha@hillsandwest.com. Ahead of the upcoming Festival of Natural Dyes, we caught up with Fibreshed Melbourne co-founder Nicki Colls, to talk through festival highlights and her work in building networks across our local supply chain. Following intense rounds of preliminary judging, the 30 semi-finalists for the Redress Design Award 2018 have been unveiled. Organised by Hong Kong-based environmental NGO Redress, this year’s competition has been the toughest cycle yet since the launch of the world’s largest sustainable fashion design competition in 2011. Reviewing a record number of applications from 56 regions, the expert judging panels scored the applicants based on creativity, originality, sustainability and market viability in order to cut hundreds of ambitious young sustainable designers down to just 30, including 1 Australian designer; Tess Whitfort from Boxhill Institute! We're thrilled to have Leila Naja Hibri, General Manager Sales & Marketing at Helen Kaminski, joining us alongside Dean World Cargo for next week's AFC Afternoon Session on Fashion Export in Melbourne! The featured designers for BT Runway 2018 share their tips for success for the next generation of aspiring designers! We'll be hosting an AFC Stand at this year's Melbourne Retail Festival, from Wednesday 28th - Thursday 29th, at The Australian Events Centre. The premium fashion trade event will host 150+ fashion, accessory and footwear brands showcasing their latest collections, along with a free series of retail business workshops and seminars. Come by Stands 3-6, have a chat to the AFC team about our programs and get to know a handful of our incredible members that will be joining us, including; Artisans of Fashion, Sample Room, Dean World Cargo, Full Circle Fibres, Fashion Equipped, Ethical Sourcing Agency, Phillips Ormonde Fitzpatrick (POF) and SURFACE 1°22! Thanks to the support of Creative Victoria, and Director & Cinematographer Noel Smyth, we've got a series of 8 micro documentaries coming your way, giving a glimpse behind the scenes of Curated and the inner workings of some of the amazing local labels that are part of the program. Australian Fashion brands are now being recognised internationally and it seems the time is right to take advantage of the originality and quality of the design talent in this country. AFC Member Dean World Cargo recognise the need for a co-ordinated approach to exporting and providing an end-to-end solution for fashion and lifestyle exporters, particularly in the small to medium sector. Get to know Thomas Puttick, director of the eponymous label and recent AFC member. The Sydney-based luxury designer is heavily inspired by classical art and remarkable women. We are excited to see where this emerging talent heads to in 2018! Get to know Ngoc Truong, one of the finalists at the MFW Student Designer Award earlier this year! The Holmesglen Fashion graduate's collection was inspired by the strength and power of a volcanic eruption, with innovative fabric burning techniques explored to create dynamic textile surfaces and sculptural silhouettes.